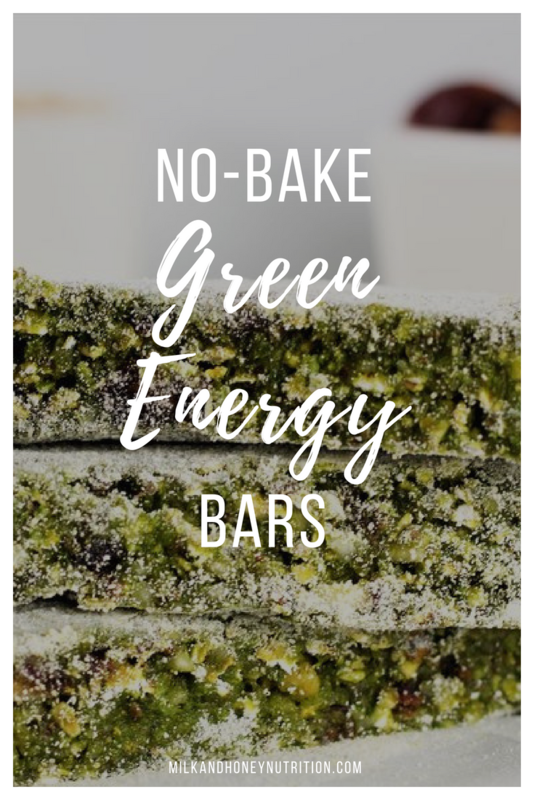 These No-Bake Green Energy Bars are loaded with fiber, antioxidants and complex carbohydrates. Make them as bars, or keep them bite sized. They offer a great way to get in some extra veggies and keep you fueled throughout your day. Add kale leaves to food processor. Process for 30 seconds. Scrape down the sides of the bowl. Add chia seeds. Process again for 30 seconds and scrape down the sides of the bowl when done. Add coconut. Process until completely combined. Empty dough into a separate bowl. Add cashews to the food processor and pulse to grind up until you're satisfied with the size of the nut pieces. Add dates, water, and green dough back to the food processor and process for 3-4 minutes until a single consistency is achieved. (The dough will be very sticky). Empty dough into a 9x13 pan lined with parchment paper and press flat. Top with a layer of plastic wrap and refrigerate for 4 hours or freeze for 1 hour. Remove from refrigerator or freezer and dust both sides with coconut flour. Cut into bars or bites.